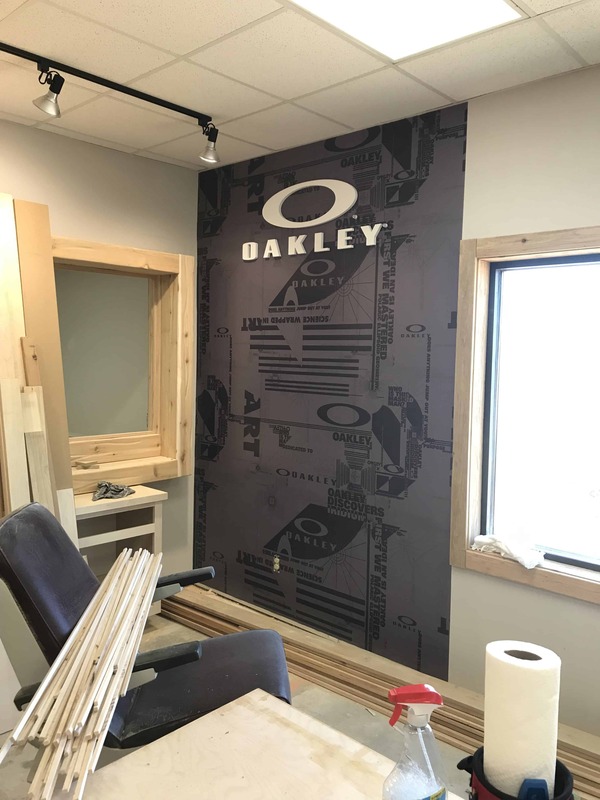 This entry was posted in Digital Graphics, Latest Projects, Signs & Banners, Wall Logo & Graphics and tagged Retail Signs, Sign Installation, Textured Surface vinyl, Textured Wall Graphics, Wall Murals, Wall Sign, Window Graphics, Window Wrap on December 4, 2018 by Steve Ballard. 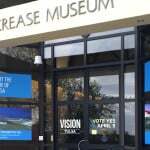 Large windows provide an ideal surface to apply vinyl graphics to advertise your business or, in this case, a current promotion or exhibit. 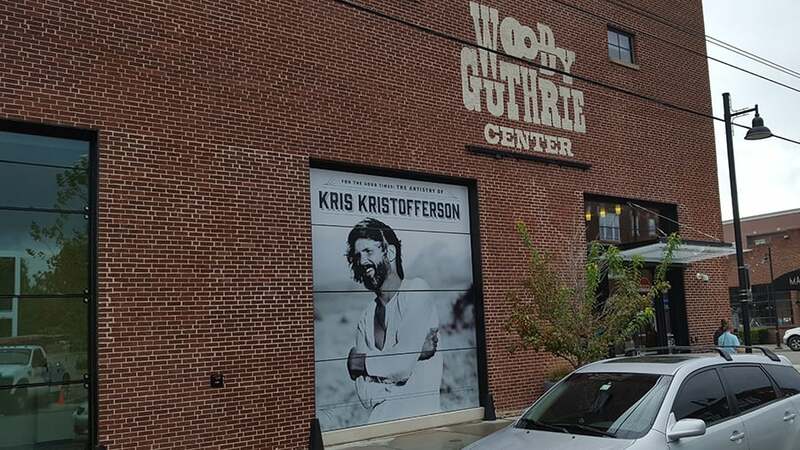 These vinyl graphics for the Woody Guthrie Center in downtown Tulsa promote the newest Kris Kristofferson exhibit currently on display. 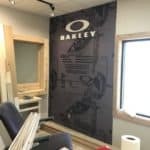 The client chose to go with a solid vinyl for this application because they are also currently housing a painting by John Cougar Mellencamp that is on display just inside these windows. 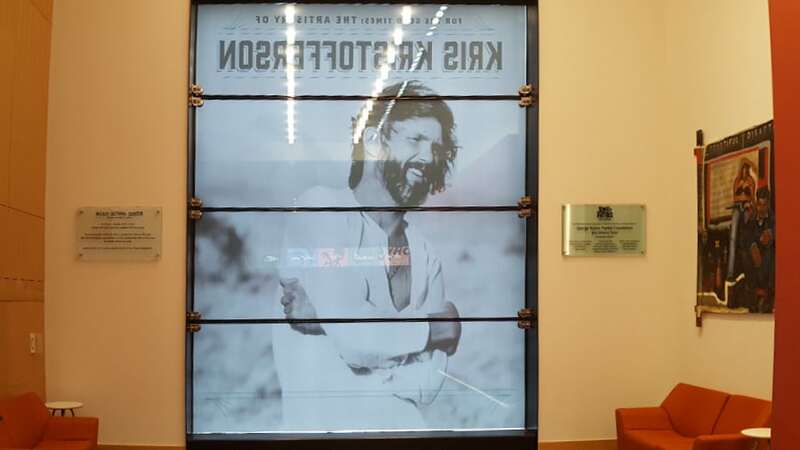 The solid vinyl restricts the amount of UV light that enters the building so it reduces the chances of the donated painting fading in direct sunlight. As you can see in the second picture, though, the vinyl does not stop all the light from entering the windows but you can no longer see through the glass. For applications when you want to still be able to see through the window to the outside, perforated window vinyl is the material to use. 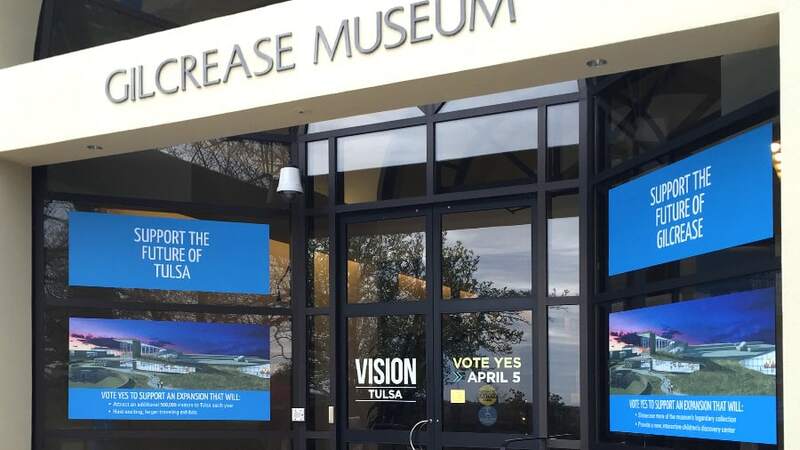 To find out more about vinyl window graphics, give Precision Sign & Design a call today at 918-430-1102. This entry was posted in Wall Logo & Graphics and tagged Textured Wall Graphics, Wall Murals, Wall Sign, Window Graphics, Window Wrap on October 12, 2016 by precision_sign. 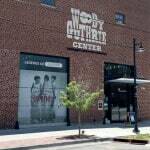 Tulsa is extremely fortunate to have a top notch facility in the Woody Guthrie Center. 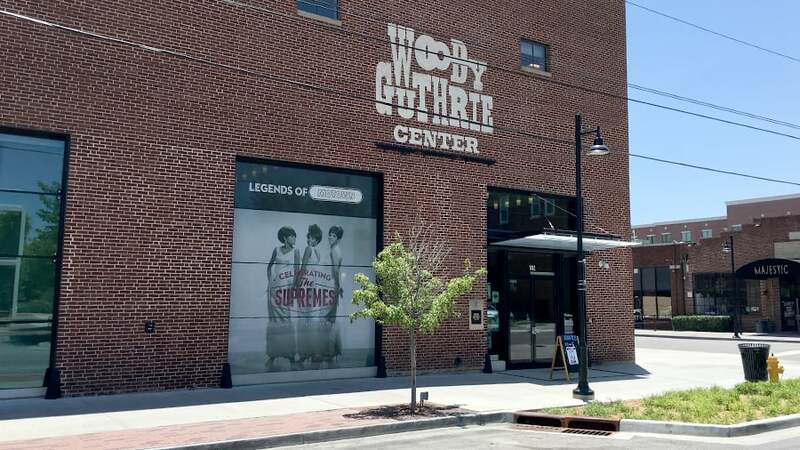 Not only does it pay homage to one of Oklahoma’s brightest stars, it has regular, revolving exhibits that celebrate other well-known musicians and musical acts. 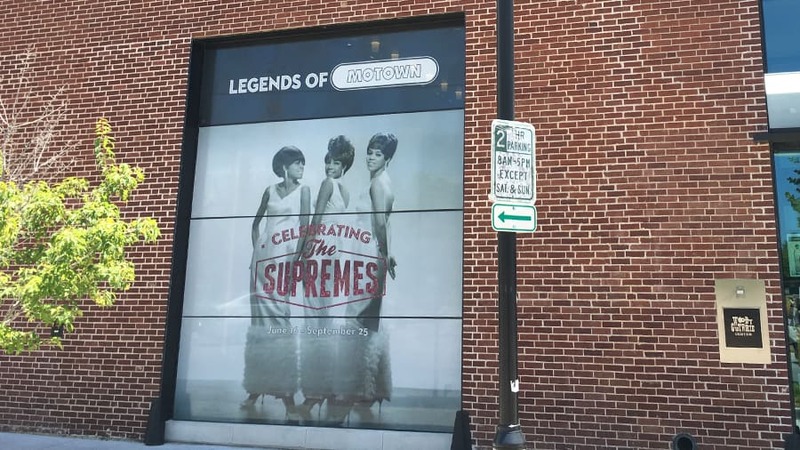 The current exhibit is The Supremes and you owe it to yourself to go check it out. There are tons of interesting items there. 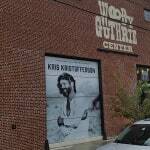 To let the public know what the current, revolving exhibit is, we wrap four large exterior windows for them. We use a perforated vinyl that will still allow light to come into the museum and also allows people inside to still see out. The backside of the film has a gray adhesive and there are holes throughout so, to your eyes, it appears just like tint. 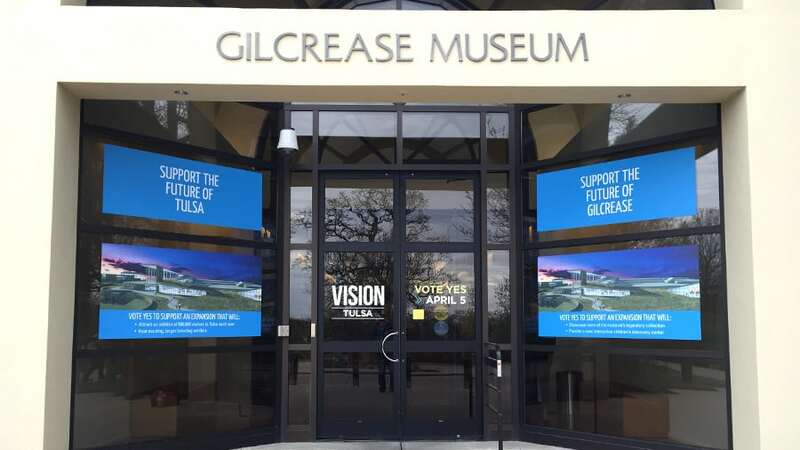 Give Precision Sign & Design a call today at 918-430-1102 to find out more about window and other graphics for your business. 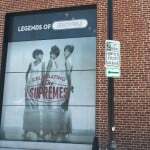 This entry was posted in Wall Logo & Graphics and tagged Sign Installation, Window Wrap on July 8, 2016 by precision_sign. 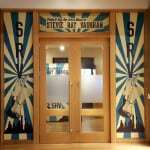 Applying vinyl graphics to windows are a very cost effective way to advertise your business or a short term event. They can be done in either solid vinyl or perforated vinyl. 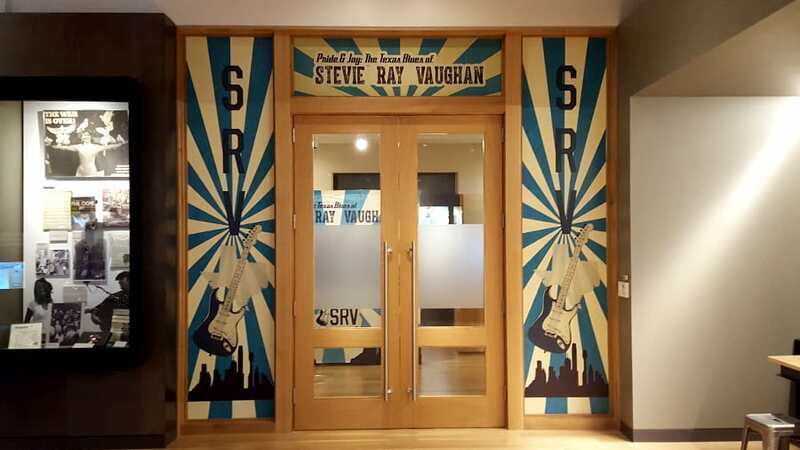 Solid vinyl will produce a graphic that is sharper but will not allow you to see through it from the inside. 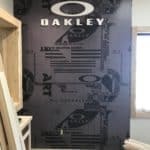 Perforated vinyl graphics do not produce an image that is as sharp but have the advantage of allowing more light to pass through and from the inside you can see right through it – it looks just like tint from the inside. 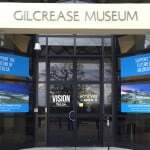 Give Precision Sign & Design a call today at 918-430-1102 to find out more. This entry was posted in Wall Logo & Graphics and tagged Textured Surface vinyl, Wall Murals, Window Wrap on May 23, 2016 by precision_sign. 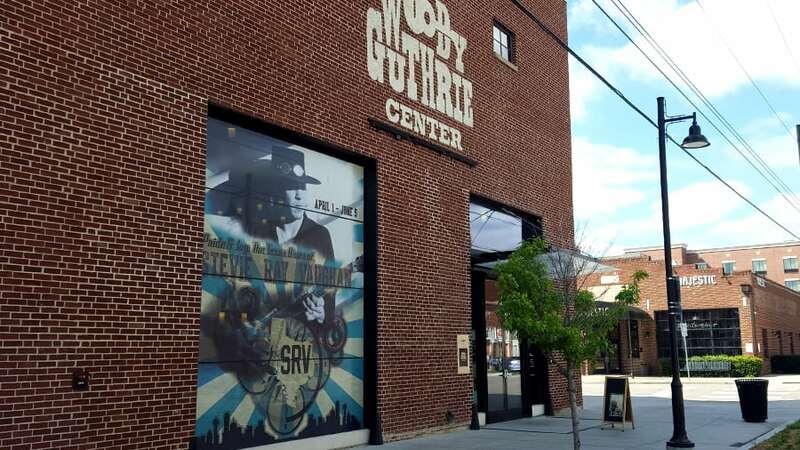 These wraps for the new Woody Guthrie Center Stevie Ray Vaughan exhibit look great. 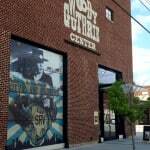 Located in downtown Tulsa, there’s no missing these graphics. The large exterior windows are 12 wide and 15 feet tall. 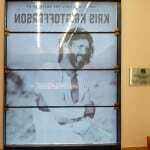 We also wrapped the interior windows of the entrance to the exhibit. Give Precision Sign & Design a call today at 918-430-1102 to find out more about wrapping your interior and exterior windows. 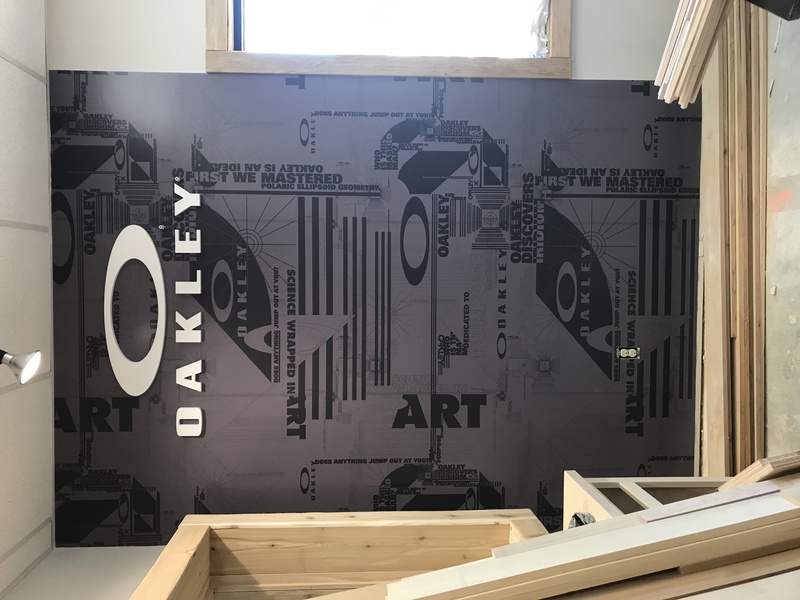 This entry was posted in Store Front, Wall Logo & Graphics and tagged Textured Surface vinyl, Wall Murals, Window Wrap on April 27, 2016 by precision_sign.